It is not so uncommon that cartilage is thought to be a cushion-like thick padding in joints. In certain extent this is true, but cartilage is also a gliding surface with very low friction in healthy joints. It is an interesting fact, that cartilage is compressed less by a rapid loading than by a constant longer loading. In that point of view, it is comparable to a bulletproof vest, which is soft to a gentle touch, but resists rapid bullet energy. Under constant compression, like when standing still for longer time, cartilage can compress 20 to 30%, and regains it thickness gradually within 90 minutes. Structure and mechanical properties of cartilage can stand approximately 70 to 200 kg/cm2 compression. This means that twisting a joint under load can easily cause focal peak loads higher than that if joint facets are not in proper contact on large area enough. This can happen in joint distortion. Cartilage doesn't crumple or tear even if it is hitted with a hammer in test conditions, if no shearing force is present, but the internal structure can be damaged. This is a start for a process, leading to posttraumatic deterioration of cartilage seen e.g during first months after ACL-surgery, or after direct hit of patella (knee cap) against thigh bone when falling down on knees. Joint would not stand all hitting stresses during jumping and running, if there were no other energy absorbing systems than cartilage in and around knee and other weight bearing joints. Muscles, fascias, tendons, and last but not least, bone under cartilage layer, are elastic and absorb these high forces and impacts. This underlines the importance of good functional coordination, and free range of motion in any joint. It also points out the importance of muscle coordination exercises after cartilage reconstruction to protect repaired area. Cartilage thickness varies in different knee joint areas. In human knee joint cartilage is usually 2-3 mm thick on weight bearing areas, and it can be even 6-7 mm thick in kneecap area. Ankle joint cartilage is rarely more than 1-2 mm thick. This is natural, and can be kept as a physiological phenomenon, but cartilage thickness seems to vary also between individual patients. Thicker cartilage doesn’t necessarily mean a better joint. 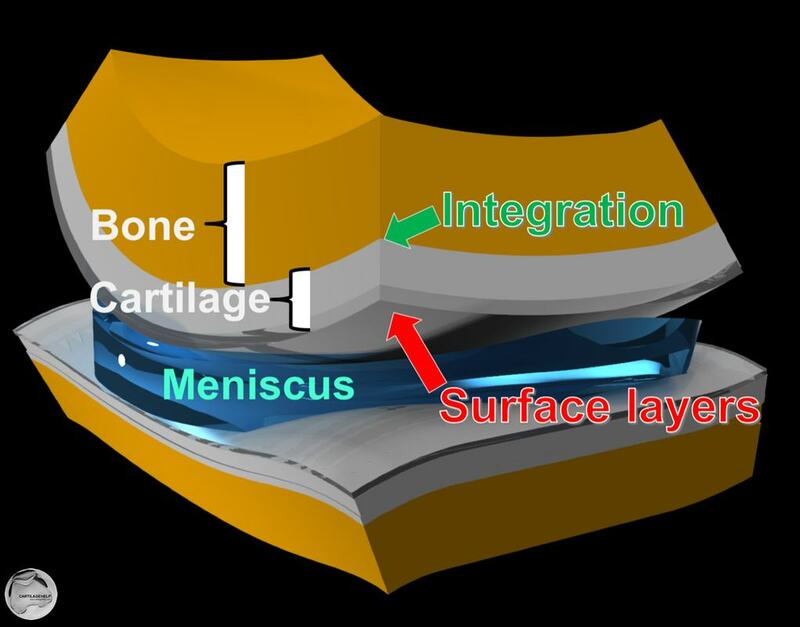 Functionally it is more important than cartilage thickness, is that there are all cartilage layers left, and that the most superficial cartilage layers are intact. Subchondral bone and cartilage work together. All the details are not yet understood, but it is evident that cartilage lesions lead to thickening of subchondral bone, and problems like avascular necrosis in subchondral bone lead to cartilage problems.